Situated in a plateau around 1,500 meters above sea level, Da Lat enjoys year-round cool weather which stands in contrast to Vietnam's tropical climate, making the city ideal for growing high-value flowering plants originating in temperate countries. Da Lat is one of Vietnam’s biggest flower-growing regions, producing around three billion flowers every year, ten percent of which are exported to foreign markets including Japan, South Korea, Taiwan, Australia and China. In recent years, small and medium-sized flower farms in Da Lat have joined bigger, foreign-invested firms in exporting floricultural products, which contributed to the city’s remarkable flower export growth. Between 2015 and 2017, Da Lat reported a yearly increase of 18-30 million in exported flowers. Japan is the city’s largest flower market, importing around 60 percent of its production, with Australia, South Korea, Belgium, Thailand, the Philippines, Singapore, Russia and Cambodia being other major markets. According to Pham S, deputy chairman of Lam Dong Province, there is around 9,000 hectares of flower-growing land in Da Lat, capable of meeting the city’s goal of shipping 400 million flowers yearly over the next five years. 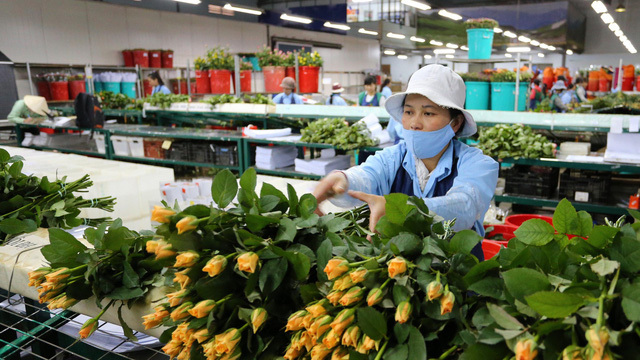 However, as Da Lat’s floricultural industry grows, plant variety rights are quickly becoming a “deadly weakness” for small exporters, said Phan Thanh Sang, president of the Da Lat Flower Association. Plant variety rights, or plant breeders’ rights, are rights granted to the breeder of a new variety of plant that give the breeder exclusive control over the propagating material and harvested material of a new variety for a number of years. Ninety percent of household flower growers in Da Lat are using seeds that violate these protected rights, which hurts their chances of exporting harvested products to developed markets, Sang said. In reality, many opportunities to export flowers to Japan have been missed when farmers were unable to answer questions regarding the breeder of their flower variety posed by officials from the Japan Externaal Trade Organization (JETRO). Meanwhile, farmers are still having difficulties getting access to flower varieties that are no longer protected by breeders’ rights, said Vo Quoc Khoa, director of flower company Dalat Green. To cope with this setback, the administration of Lam Dong Province has introduced a model where major companies partner with local farmers by providing them with quality flower seeds and growing techniques, in exchange for harvested crops. The province is looking to launch a flower exchange and online platforms where foreign importers can place orders for Da Lat-grown flowers online.